Jewish studies have for centuries formed a central part of the academic work within faculties of theology and the humanities in the Nordic countries. Research relating to Judaism is conducted from a broad spectrum of theoretical perspectives, ranging from historical and exegetic approaches to cultural and linguistic studies as well as ethnographic investigations spanning diverse cultural and geographical areas, time periods and communities. The field is thoroughly interdisciplinary, combining methodologies from the humanities, theology and the social sciences. 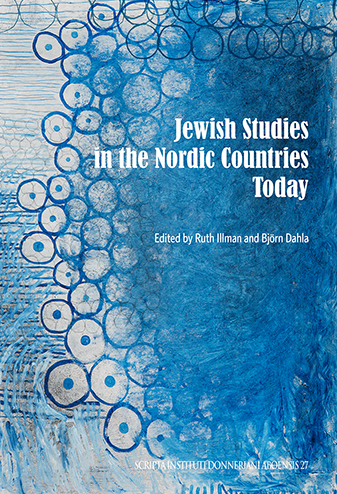 This volume presents articles by Nordic scholars working with Jewish subjects in their research. It deals with current approaches, findings and challenges within the research field from a variety of theoretical, methodological and epistemological perspectives, ranging from rabbinic theology to comtemporary ethnography. Thus, in addition to giving an overview of the state of research in the Nordic countries today, the volume also contributes to the lively and creative scholarly discussion in the field where different perspectives can meet. The relationship between food and religion is a lived activity formed by the dynamics of both tradition and adaption. Religious commitments to food are influenced by several different factors, ranging from personal spirituality and experiences to social patterns of belonging as well as ethical, political and doctrinal convictions related to food and eating. Today, this topic is receiving increasing scholarly attention and has become a relevant focus to a broad spectrum of researchers working with different religious traditions and contemporary spiritualities. 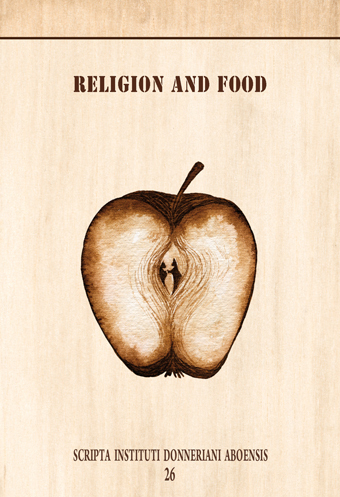 This volume addresses the questions of why and how persons of various religious and spiritual liaisons seem to engage in food and eating with a growing zeal today from a variety of different theoretical and methodological angles, such as: folkways/foodways and vernacular practices; tradition, memory, and nostalgia; boundaries, identity, and control; symbolism, authenticity, and fluidity; consumption and abstention; ethics and environmentalism; the global, local, and glocal. 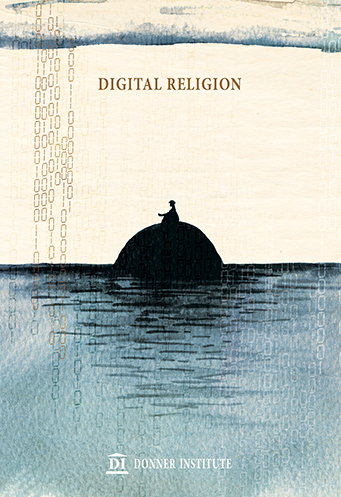 The theme of the current volume of Scripta is the emerging field of research connected to Post-secular religious practices. Special attention is given to the trend of combining a renewed openness to questions of the spirit with the habit of critical enquiry in relation to health and body practices. A common feature underlined in many of the articles is the inspiration offered by religious and spiritual traditions to work with oneself – body, mind, spirit – as well as with one’s emotions, goals, values and relations. People are today increasingly seeking a non-dualistic understanding of life and what it means to live in health and harmony. The articles present a great variety of themes connected to the topic, ranging from yoga, meditation and reiki to salutogenic therapies and evangelical fitness movements. Different forms of healing practices are also highlighted, some with roots in historical religious traditions, other based on contemporary spiritual practices and innovative combinations of elements from different religious and cultural contexts. 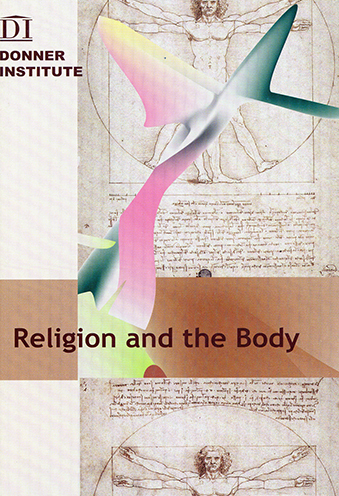 During recent years, the body has become a central focus of religious studies. The understanding of religion as a solely intellectual practice of beliefs, norms and convictions is giving way to a broader understanding of religious subjects as contextually situated agents with a personal history, emotions, values, gender and – as is explored at length in this volume – a body. 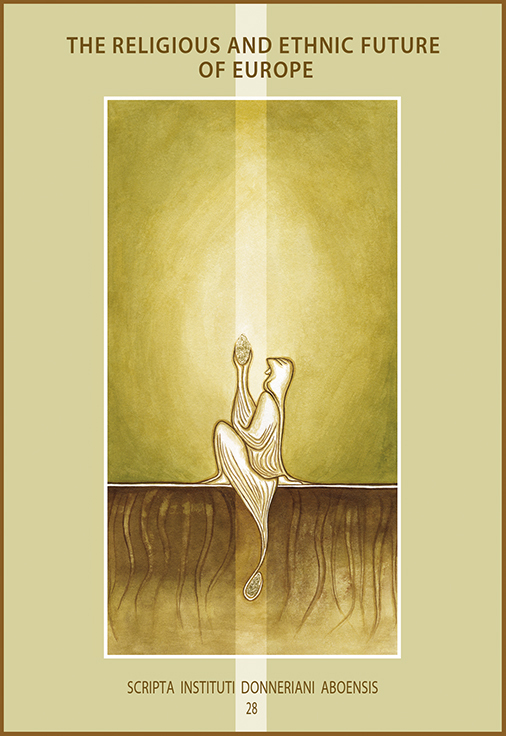 Religious and spiritual practitioners today seek a connection with the divine through their bodies, acknowledging the intimate connection between soul, mind and body on questions of human well-being, meaning-making and religious experiences. This may always have been the case in lived religion, but for scholars of religion the recognition of the body offers a fairly novel approach. 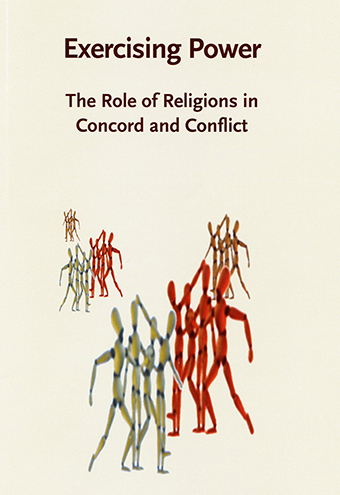 In this volume, the body as a theme for religious studies is presented and discussed in relation to several religious traditions including Judaism, Islam, Christianity, Hinduism and Buddhism as well as Contemporary Spirituality. The subjects dealt with include, among others, such varied themes as sports and thinness, gender identities, asceticism and charismatic rituals. Pilgrimages can tentatively be described as journeys undertaken by individuals or groups to a place, which for the persons involved in the journey is of great importance; either for religious or spiritual reasons or for reasons pertaining to other aspects of the person’s history, cultural milieu and social situation. 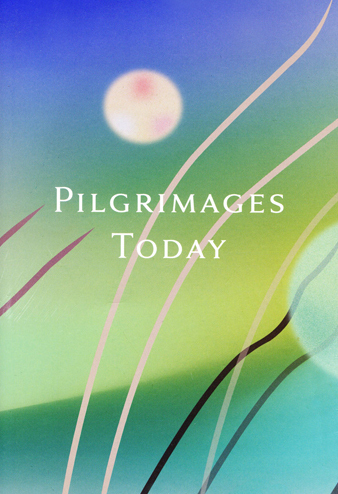 The current volume does not limit the theme of pilgrimages to conventional or traditional religious journeys, but aims at exploring the wider field of travelling akin to pilgrimages in our contemporary culture to shed light upon similarities as well as differences in motivations, practices and perspectives. The volume presents a number of theoretical analyses of pilgrimages as a phenomenon of the twenty-first century, but also several rich and intriguing accounts based on ethnographic work. The themes range from traditional and collective pilgrimages within the world religions – such as the Orthodox Christian tradition of visiting Mount Athos or the Muslim festival Biswa Ijtema in Bangladesh – to more contemporary and individualistic pilgrimages. Examples of this latter category are e.g. the memorial practices connected to late Lady Diana Spencer, Dracula tourism and motorcycle pilgrimages. 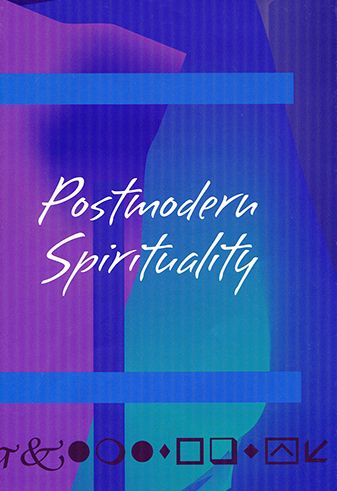 Postmodern Spirituality is an umbrella term that covers a broad number of beliefs and approaches that fall under a common, though rather fuzzy, category. Within this category, one finds a wide variety of spiritual practices by which people strive to handle spiritual and existential questions in novel, innovative and often eclectic ways, outside the boundaries of traditional, established religious organisations. 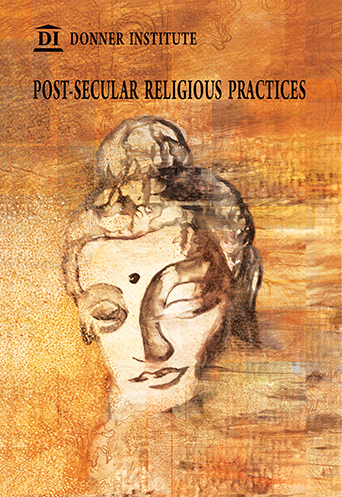 The many ways in which human beings build up personally meaningful and empowering spiritual practices by combining elements from several different sources – religious as well as secular – is thus the focal point of this volume. The articles in the volume present the theme of spirituality in relation to, for example, mysticism, capitalism, individualism, healing and education. Several articles on spirituality in popular culture are also included. The concept of Western Esotericism includes a multiplicity of traditions and lines of thought included in Western culture, from antiquity and the renaissance up to modern times. It is often used to refer to different forms of hidden knowledge, accessible and comprehensible only to especially initiated persons. The theme bears special significance for the Donner Institute as the study of mysticism and esotericism – especially in relation to the Anthroposophic movement – is defined as one of the main aims of the institute. The current volume presents articles on prominent profiles such as Rudolf Steiner, Jacob Böhme and Emanuel Swedenborg. The theme of esotericism is explored in a number of different contexts, including Freemasonry, Mormonism, Theosophy and Kabbalah, often focusing on the history and development of these movements in the Nordic countries. 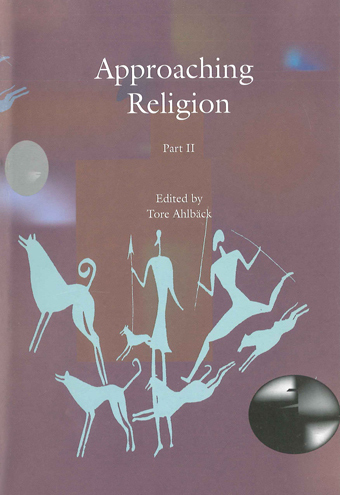 The current volume is based on papers presented at the conference by the same name, arranged by the Finnish Society for the Study of Religion (SUS) together with the European Association for the Study of Religion (EASR) in Turku/Åbo in 2005. Most of the articles deal with notion of power in relation to external conflicts – political, ethnical and often violent clashes where religious aspects are involved. The notion of authority in relation to power is also discussed by several authors. It is worth noting that 'concord' seemed to draw much less attention than “conflict” at the conference, perhaps due to the reigning circumstances in the world at large. The themes of the articles span most continents and religious traditions, from Israel to Costa Rica and from Rwanda to Iraq. The articles offer several examples of ritual and rhetoric violence but also analyses of dialogue efforts, issues of gender and sexuality as well as ecology and identity politics. 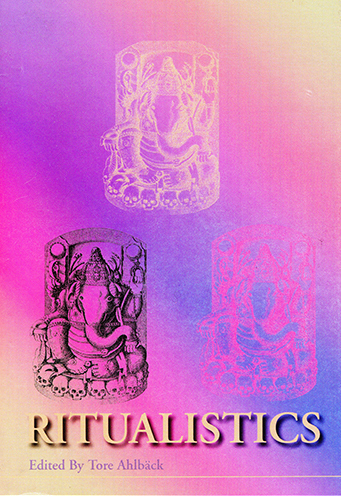 The problem of ritual has been a central topic of religious studies since the earliest days of the research tradition. Rituals offer material for interesting paths of inquiry related to both historical and contemporary perspectives, and can also be viewed from several different angles, such as the sociological, psychological, ethnographic or theological. This visible form of religious engagement is especially interesting to discuss in relation to the increasing secularisation of the public spaces and discourses in the Nordic countries today. Among the articles we find significant contributions concentrating on theoretical aspects of rituals. Some authors present novel analyses of ancient religious rituals, such as pilgrimages to Jerusalem, Japanese rites of passage and Dionysian mysteries. The issue also includes a number of articles that deal with rituals of a modern, non-traditional kind, such as Neo-pagan cyber rituals, Christian rock concerts and women’s recreation of ritual practices. By tradition, the study of religion has predominantly been concerned with intellectual aspects of faith and believing, focusing on texts, systematised creeds and articulated truth claims. Aesthetic dimensions of religions have thereby tended to receive less attention. As a consequence, contemporary scholarship is often unable to account for other aspects of human religiosity than the purely intellectual, such as the visual, the oral, the tactile and other sensory experiences within the religious frame of reference. By highlighting the relationship between religion and the arts, the current volume seeks to find a new, more multidimensional trajectory for the study of religion. 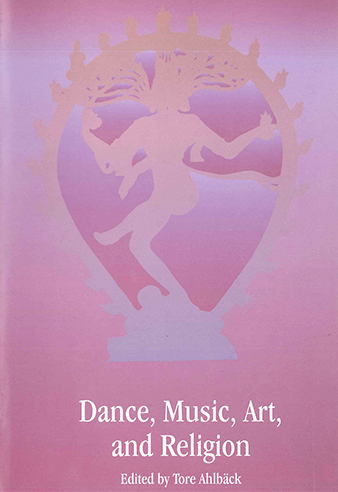 The articles in this volume address several different art forms – among these for example dance, drama, music, images and video art – and their relation to specific religious contexts. As is clearly shown by the varied themes presented in the volume, the arts play a prominent role as mediators of religious experiences and as expressions of religious sentiments, for individuals and for communities, in history and up to the present day. Religious rites play a key role in most religions and spiritual traditions of the world. For researchers of religion they offer an especially prolific source of knowledge and data due to their empirical character – most rituals are acted out in one way or the other and can thus be observed. Ethnographic research from different contexts can, furthermore, be compared in a scholarly way, thus opening up greater possibilities for cumulative research. Historical perspectives on rituals are presented in articles on ancient Greek and Roman cults as well as Germanic prehistoric customs and Norse mythology included in this volume. Theoretical perspectives are offered from psychological and methodological points of view and several contemporary practices from Hindu, Muslim, Buddhist and Shamanic contexts are analysed. By coining the term ritualistics, the volume also seeks to introduce a new paradigm for the study of rituals. The current volume is based on articles presented at a symposium by the same name, arranged by the Donner Institute in 1984. The aim of the symposium was to gather a limited number of experts from different academic disciplines – such as archaeology, anthropology, ethnology, history, art, theology, musicology and the history of religions – to shed light on the Saami drum from as broad a perspective as possible. As a result of the meeting and this volume of articles on the theme, the Nordic research in the area was highly stimulated and brought to international attention. 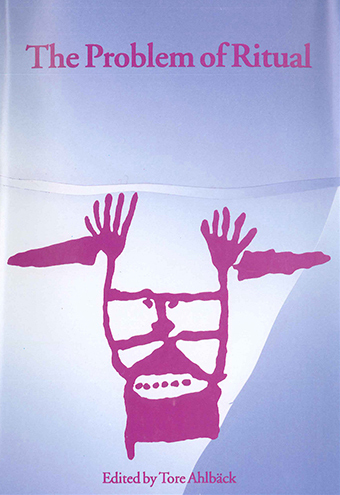 The articles discuss several different issues relating to the Saami shaman drum: drum illustrations and individual drums as sources of information on Saami culture and religion, the role of the drum in Saami society, the significance of drum music in shamanic rituals to name a few. Comparisons with other Arctic peoples are ale presented. 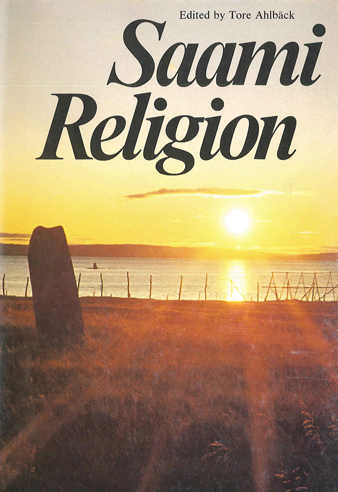 In September 1986 the Nordic Cooperation Committee for Humanistic Research presented a report on the research into Norse religion within the Nordic region. The report pointed out the need for intensified research efforts in the field, declaring it to be matter that should be of greatest importance for Nordic scholars. The Donner Institute reacted swiftly to this call by arranging a symposium on the theme the following year together with the philological research organisation Nordic Cooperation Committee for Place-Name Studies (NORNA). 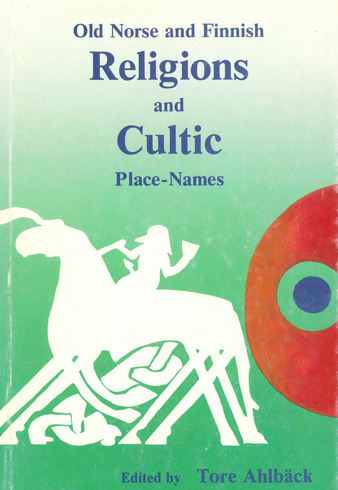 The articles included in the volume thus represent two main categories: firstly, research into pre-Christian religious beliefs and cultic practices in the Nordic region and, secondly, research into place-names from the same period and the light they may shed on beliefs and cults in the pre-Christian era. The aim of the current volume is to present recent advances in the research on Saami culture and religion. Thus, these articles strive to answer the call for an international coordination of all forces in order to build a solid foundation for research in the field, aired by the pioneering scholar Ernst Manker a few decades earlier. 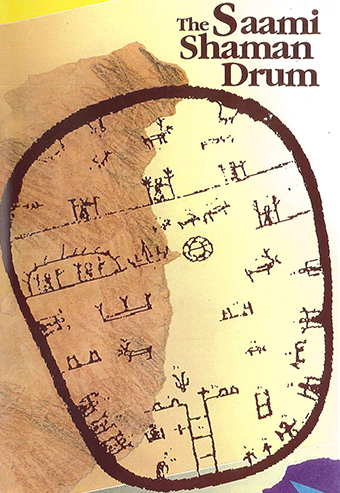 The volume contains several articles dealing with pre-Christian Saami religion. The confrontations between Saami religion and Christianity are also dealt with in different ways by several of the authors. Finally, contemporary perspectives on the question are addressed in articles dealing with the role and status of the Saami people as an ethnic minority in the Nordic countries today. Religious symbols play a significant role in the lives of individual human beings as well as in the lives of religious groups. Within the research on religion, symbols have traditionally been an object of interest for scholars approaching the theme from a phenomenological point of view. As a result of the influential studies on religious symbols presented by Sigmund Freud and Carl-Gustav Jung, however, studies on the psychological aspects of symbolism in a religious context started gaining ground in the second half of the 20th century. 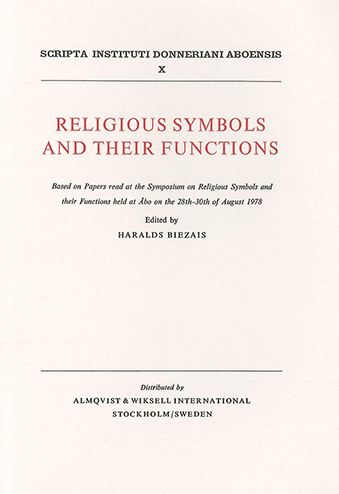 This volume, based on a conference on the theme arranged in 1978, reflects the diversification of the research on religious symbols that was emerging at the time. Instead of offering a definitive description of the functions of religious symbols, the volume bears witness to the changing and fluid circumstances in which human beings come in contact with religious symbols and rely on them in the quest for an integrated and meaningful reality. 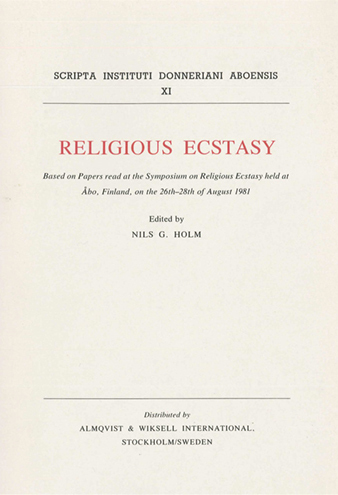 The volume is based on papers read at the Symposium on Religious Symbols and their Functions held at Åbo on the 28th-30th of August 1978. Ed. by Haralds Biezais. Stockholm : Almqvist & Wiksell, 1979. The current issue deals with a central aspect of religious social life: the formation of institutions. Religions are always embedded in a context formed by time and place, culture and history; hence, they are part of the socio-cultural structures of the communities in which they occur. Institutions tend to provide stability to religious life, fixing it in forms that endure over time. Human religiosity is a dynamic phenomenon, however, fluid and changeable. Therefore, the structures of religious life are formed by the opposite forces of stabilising institutions and dynamic change. Several of the articles included in the current volume deal with theoretical aspects of dynamics and institutionalisation in the religious sphere, both from sociological and psychological perspectives. The volume also includes ethnographic accounts of dynamics and institutions from Muammar Gaddafi’s Libya and Eastern Tanzania to Finland. 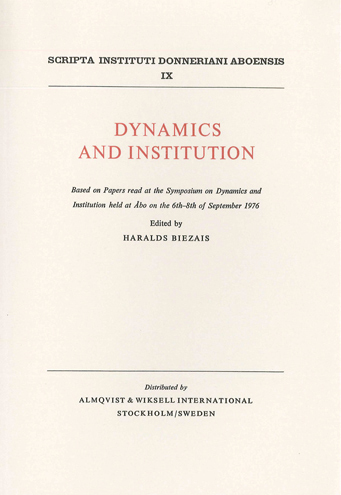 The volume is based on papers read at the Symposium on Dynamics and Institution held at Åbo on the 6th-8th of September 1976. Ed. by Haralds Biezais. Stockholm : Almqvist & Wiksell, 1976. 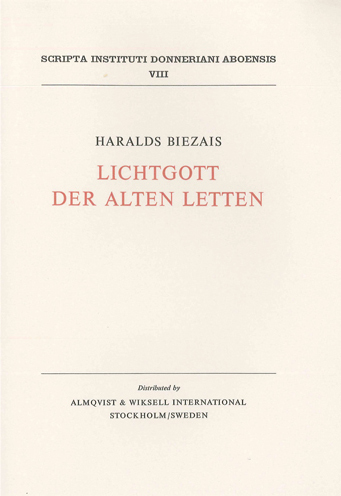 Professor Haralds Biezais, director of the Donner Institute 1968-1978, has authored the current volume of Scripta, dealing with the indigenous religious tradition of Latvia and especially the Light God Ūsiņš. The work presents the light god based on folkloristic and lexicographical source material, including epics, folktales, place names, archaeological findings and historical scripts. The nature and function of the Light God, his role in the life of the Latvian peasants, the cultic activities and the place of the Light god in the greater Latvian pantheon are described and analysed. Furthermore, the influence from German and Slavic indigenous traditions – and later from Christianity – are outlined and assessed. 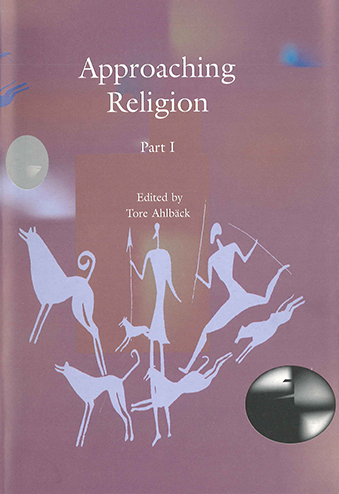 This volume presents research on religious movements that were characterised as 'New Religions' at the time when the volume was originally published, i.e. in 1974. Among the groups presented in the volume can be found: Millenarism in India, Maoism, Children of God, the Occult Revival, Jehovah’s Witnesses, revitalised indigenous traditions in North America as well as several Christian revival and countercultural movements. What is 'new' in these new religious movements? How can the diverse field of emerging religious trends be classified and how, as a consequence, should scholars of religion develop their terminology to better account for the new situation? These, and a number of other theoretical issues, are brought to the fore in the ethnographic accounts of new religions. 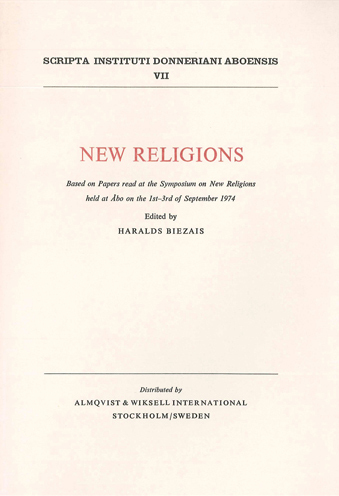 The volume is based on papers read at the Symposium on New Religions held at Åbo on 1st-3rd September 1974. Ed. Haralds Biezais. Stockholm : Almqvist & Wiksell, 1975. 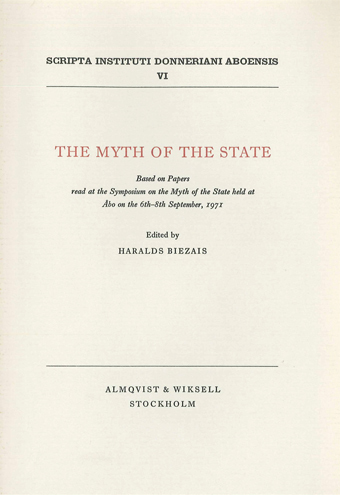 Mysticism has been a central part of the study of religion in the Nordic countries since the groundbreaking works of Tor Andrae and Nathan Söderblom were published in the early twentieth century. 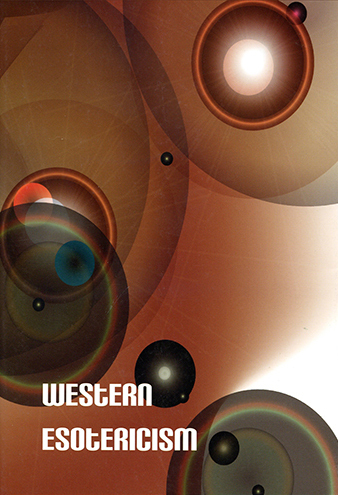 In this volume, based on a symposium on mysticism held at the Donner Institute in 1968, several of the leading scholars of religion of the time present their research on mysticism from historical, psychological, theological and linguistic points of view. Among the authors are found e.g. Hjalmar Sundén, Holger Tesleff, Birgit Klockars, Wilho Rinne and Åke V. Ström. Mysticism is highlighted in a historical as well as in a contemporary context and the difficult question of 'faith and reason' – in its present variant of 'mysticism and scholarship' – is challenged and discussed. 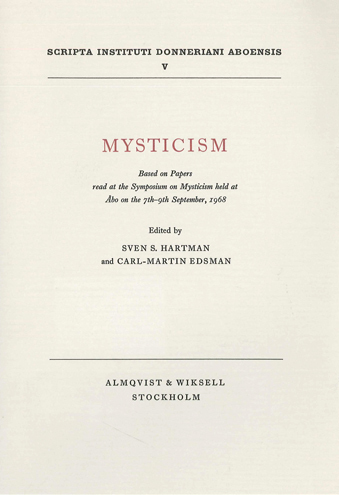 The volume is based on papers read at the Symposium on Mysticism held at Åbo on the 7th-9th September, 1968. Ed. by Sven S. Hartman and Carl-Martin Edsman. Stockholm : Almqvist & Wiksell, 1970.